Production Company: Vitagraph. Director/Writer: Jess Robbins. Cast: Jimmy Aubrey (Bum), Oliver Hardy (Thug), Evelyn Nelson (Urchin Girl). Transfer Note: Copied at 18 frames per second from a 35mm print preserved by the Library of Congress from source material provided by EYE Filmmuseum. New Music: Ben Model. Running Time: 21 minutes. Before 1916 the Vitagraph Studio set the standard for polite situational comedies with the films of John Bunny, Flora Finch, and Mr. and Mrs. Sidney Drew. This all changed when a young newspaper cartoonist named Larry Semon joined the firm and ushered in a new emphasis on surreal gags and slapstick. By 1919 the studio had a three-tiered comedy output. The “A” series starred Semon, the “B” series were the comedies of Earl Montgomery and Joe Rock, and the “C” unit’s star was Jimmy Aubrey. A veteran of the English music hall and Fred Karno’s Comedians, Aubrey had worked onstage with Charlie Chaplin and was one of the numerous British comics brought to the American screen when Chaplin’s popularity went through the roof. Producers looked for comics with a similar background and experience to try to claim their own spot on the Chaplin gravy train. Aubrey entered films in 1915 when he was teamed with Walter Kendig for the Mittenthal Film Co.’s “Heinie and Louie” comedies. Following two years of being part of these Weber and Fields clones, Aubrey moved to Vitagraph, where he first supported Hughie Mack and then got his own starring shorts. Aubrey was not a subtle performer; his character was that of a combative bum who had an oddly parted brush mustache that looked like he had a caterpillar growing out of each nostril. His time at Vitagraph was the peak of his career, as he had talented costars and directors, but after frequent clashes with the studio he left in 1923. He was soon doing cheaper shorts for Chadwick, Joe Rock, and Weiss Brothers Artclass Pictures, and by the end of the 1920s was turning up in many bit parts. After sound arrived he continued doing bits, particularly in B westerns, until around 1955. Remaining combative until his death at 94, Aubrey had nothing but caustic remarks about his former colleagues. Acting circles around Aubrey as the villain, as well as taking advantage of any gag opportunity that isn’t nailed down, is Oliver Hardy. A natural and instinctive actor, Hardy always realized that less is more and, even before Laurel & Hardy, was able to take an audience into his confidence with sly looks to the camera. After starting his career with Lubin and moving through Vim and King Bee, Vitagraph was a jump up the studio food chain for Babe. After 26 films together, the jealous Aubrey dropped him from his company, so Hardy moved on to support the studio’s top comic, Larry Semon. The next few years saw Hardy becoming more prominent and ending up as part of the stock company at the Hal Roach Studio. Once he was teamed there with Stan Laurel, the rest is history. The Backyard was directed by Jess Robbins, an unsung pioneer who began his career as a cameraman in 1908 with Essanay. Heading out west to Niles, California, with G.M. “Broncho Billy” Anderson, Robbins was the general manager and supervised Charlie Chaplin’s unit for Essanay. He later directed at L-Ko and helmed Aubrey’s 1920–21 two-reelers. Reuniting with Anderson to direct Laurel in The Lucky Dog (1921), Robbins brought Oliver Hardy along to play the heavy. The 1920s saw Robbins becoming involved in features such as A Front Page Story (1922), along with writing and directing shorts for Billy West, Lupino Lane, and Fox. After he directed his final feature, the British made Skirts (1928) with Syd Chaplin, Robbins’ career came full circle with his last film, the Ben Turpin short Taking the Count (1929). Robbins had started Turpin at Essanay in 1908. Running a taxi service, operating a machine screw factory, and working at a water purifying equipment company kept Robbins busy until his death in 1973. The Backyard was preserved in 2018 at Colorlab Corp. using the only known surviving element: a 35mm tinted nitrate print from EYE Filmmuseum. The intertitles were translated from the Dutch and are modern re-creations. 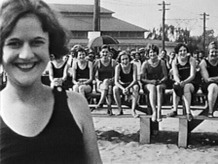 The work was supervised by the Library of Congress with funding provided by the National Film Preservation Foundation.